Visitation at the Recreation Area is swiftly increasing as more Californians realize its recreational potential. More than 200,000 visitors are expected annually. The peak use season at the Salton Sea State Recreation Area has traditionally been from October through June, when comfortable day time highs in the low to mid seventies, and lows at night in the fifties are the norm. Summer temperatures in the desert can be very hot from July to September. 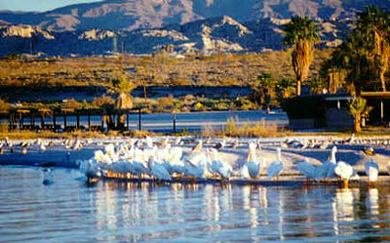 Salton Sea State Recreation Area offers many in-season events, from educational programs to boat races. Bird watching is best from November through February. Fishing is best from June through September. Boating is good any time, and vistas of the Santa Rosa Mountains across the massive lake are free for the taking. Reservations are suggested during winter months, but are not necessary for off season use. Many RVers are finding that their air-conditioned rigs make for a comfortable stay after a summer day of fun on the Sea. The park is located on the Pacific Flyway, and 400 different species of birds have been counted at the Salton Sea--almost half of the 900 species known to exist on the North American Continent. During winter migration up to four million individual birds are estimated to use the Sea each day. There is a greater species variety and more individual species here than any other place in the nation. The park has five campgrounds with a total of 1,600 campsites. The popular full hookup sites at the Headquarters Camp should be reserved in advance. The pleasant developed campsites are the most frequently used, and are well suited for RV or tent camping. Developed sites can be found by Varner Harbor, and at Mecca Beach Campgrounds. Three beach campgrounds--Corvina, Salt Creek, and Bombay Beach--provide a more primitive camping experience along the lake's shoreline. The Salton Sea State Recreation Area has hundreds of day use sites, a boat ramp and wash area, trails, a visitor center (open during peak season), a play area for the kids, and fishing jettys. During the season, Rangers offer guided tours in the park's interpretive boat to view the birds for which the Recreation Area is famous. The park is located on the Pacific Flyway, and 400 different species of birds have been counted at the Salton Sea--almost half of the 900 species known to exist on the North American Continent. During winter migration up to four million individual birds are estimated to use the Sea each day. There is a greater species variety and more individual species here than any other place in the nation.